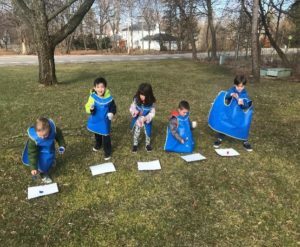 Preschool classrooms follow standards set by NAEYC and use Creative Curriculum as a guide to offer as many learning opportunities to our children as possible. 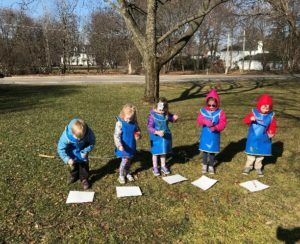 Teachers provide a variety of developmentally appropriate activities and materials that are selected to emphasize concrete experiential learning. The children have opportunities to feel successful and to feel good about themselves, develop independence, use a variety of materials and take part in activities which encourage creativity. They learn new ideas and skills and participate in imaginative play. The pre-school program uses a theme calendar. Every 1-2 weeks the focus changes giving the children a wide range of activities and books and visuals to enrich their learning experiences. Program components include physical, social, emotional, intellectual, and spiritual development. Daily activities include, quiet and active, individual, small group and large group, large and small muscle programs, child initiated and staff initiated activities, developmentally appropriate language and literacy experiences of not less than 30 minutes, early math and science experiences, indoor and outdoor activities. WHAT TO BRING: Lunch, change of clothes and appropriate outdoor clothing. 9:45 – 12:00 Centers, free play, activities, music, math, science, writing, art, dramatic play, blocks, music and movement, sensory, manipulatives, cooking, games, outdoor play and small and large motor activities. Bathroom breaks, hand washing and cleanup are included throughout the day.